Arguably the oldest magic trick in existence, the Cups and Balls trick has lost none of its magic with age. The magician, standing behind a table, displays three identical cups and three small balls. Setting one cup down, the magician puts one of the balls on top of it and then covers it with the other two cups. A tap of the top cup and the magician removes the stack of cups to show that the ball has penetrated the cup and is now lying on the table. Covering that ball with a cup the magician repeats the process, showing after the tap there are two balls on the table. A third time and the last ball is penetrated, showing all three balls on the table. A fourth ball, cleverly kept hidden, allows this mystery to take place. Stack two cups, put the fourth ball inside the second, and put the third cup on top. 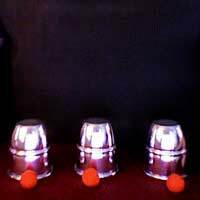 You are now set to perform the basic routine of Cups and Balls. This trick can be done close up or on stage and while the basic trick explained here will certainly amaze the audience, the magician can add infinite variations to the routine to continue to amaze. The magician should place three balls in the top cup and the stack on the table and he is now ready to begin. Picking up the cup stack, the magician spills the balls into his hand and then places them in a row on the table, roughly six inches apart. Holding the stack of cups in his left hand, the magician should keep it tilted slightly towards his body, so the audience can not get a clear view of the bottom of the cup on top. Removing this cup with the right hand, the magician places it on the table behind the right-most ball. The motion should be smooth and fluid. The stack of two cups left in the left hand has the hidden ball in the top most cup. In the same motion as above, the magician takes that cup and places it on the table behind the middle ball. The smooth motion will keep the fourth ball hidden. The third cup is placed behind the left most ball. The middle ball is picked up and placed on top of the middle cup. The end cups are picked up and stacked on the middle cup. A tap and a magic word, and the magician explains he will cause the ball to penetrate the bottom of the cup. Lifting the stack the hidden ball is revealed, apparently having passed through the cup. The stack is already set to perform again. This time the middle cup is placed over the ball already on the table and the right most ball is put on top of it. The process is repeated, and when the stack is lifted there are two balls on the table. The magician repeats this process with the last ball and shows his mastery over nature for a third time. This is the most basic form of Cups and Balls- the magician should master this first and then begin to add to the routine, such as vanishing a ball with a finger palm and then “tossing it” invisibly through the air to appear under a cup.